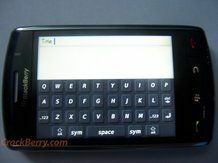 RIM's rumoured BlackBerry Thunder handset is coming to the UK, but under the moniker of the 'BlackBerry Storm'. Sources have confirmed to pocket-lint that the first full touchscreen model in the BlackBerry series will be available in the UK, and could be here as early as October. "Vodafone will be the exclusive operator in the UK with the 'Thunder' name being ditched in favour of the global 'Storm'," said an anonymous source. The handset will debut at the end of October, the sources say, with the official announcement coming in just over a week. This means the highly anticipated handset, which has been touted strongly in the US thus far, will be ready for the mad Christmas rush which will see it going head to head with the likes of the Apple iPhone 3G, the Nokia N96, the Samsung Omnia and the G1 Google handset. For the consumer this is nothing short of an (HTC) dream, with a huge range of top-notch handsets to choose from when sitting on Santa's knee.